Can Toshiba's expensive Android tablet cut in to Apple's iPad sales? While the AT100 does have some saving graces, it is way too much money for an average Android tablet. 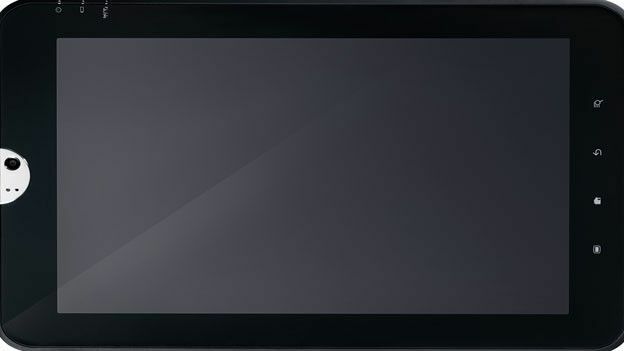 As with all modern tablets, a dual-core nVidia Tegra 2 processor keeps the cogs turning. HD movies play without stutter, although it isn't the smoothest viewing experience thanks to jerky motion during action scenes. The battery survives long enough to watch 270 minutes of video, an above-average result. We were disappointed by the display, which is duller than the screens of most rival tablets. Compared to the Sony, for instance, photos lack vibrancy and feel lifeless. However, the capacitive surface is responsive to swipes and gestures, which makes for comfortable web-browsing. Video streamed from the likes of 4OD fared a lot better than HD movies, and can be played in Android Honeycomb's browser. You don't get many pre-installed apps, but this is a good thing in our eyes as you don't have to spend hours deleting any pointless rubbish. The Media Player app is a pain-free way to enjoy films and music, while the ThinkFree Write app can be used to craft Word documents. Additional apps can be downloaded from the Android Market. The 16GB of built-in storage can hold dozens of movies, and you can copy files to and from a USB stick, thanks to the hidden USB port and File Manager app. It's a cheap and handy way of carrying extra movies on long trips, and an alternative to the SD Card slot. You also get a full-sized HDMI port. We couldn't work out why Toshiba decided to attack the high end tablet space with a such an average Android based device. Better is the company had lowered some of the specs and put it on the market at half the price. That said, this tablet is best used to browse the web while reclining on the sofa. Commuters are better suited by a more compact, lighter device.